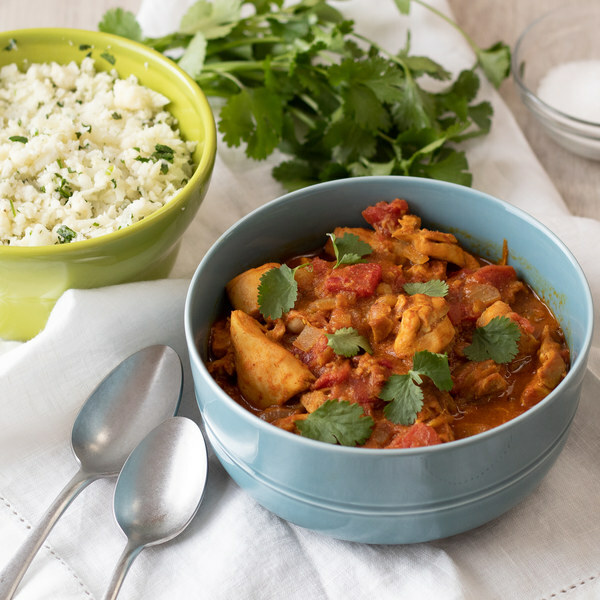 ← Chicken Korma with Cauliflower Rice. Pat the chicken dry with paper towels, cut into bite-sized (1-inch) pieces, and set aside. Peel and small dice onion. Peel and mince (or press) garlic. Wash, peel, and mince or grate ginger. Once the saucepan is hot, add coconut oil and swirl to coat the bottom. Add the onions, garlic, and ginger; cook, stirring constantly until onions are softened, 3 to 4 minutes. Add the spices and cook, stirring constantly, until fragrant, 30 seconds. Add canned tomatoes, chicken, salt, and pepper; stir until well combined. Bring to a boil and then reduce heat to medium, cover and cook until chicken is cooked through, about 10 minutes. While the chicken cooks, preheat a large pot over medium-high heat. Wash the cauliflower and remove the leaves. Using a food processor or box grater, grate to rice-like texture. Once the pot is hot, add oil and swirl to coat the bottom. Add cauliflower and cook, stirring occasionally, 5 to 7 minutes. Meanwhile, add the heavy cream and almond flour to the chicken mixture. Uncover and cook for another 5 minutes, stirring occasionally. Wash and dry cilantro. Shave leaves off the stems; discard the stems and mince the leaves. Set some cilantro aside to use as garnish. When cooked, remove the cauliflower from the heat, add remaining cilantro, salt, and pepper and stir to combine. To serve, place cauliflower rice on a plate and top with chicken korma. Garnish with cilantro and enjoy!